I am a member of the Lawn Reform Coalition, a group of garden designers and environmental advovates who are promoting new ways to think about the American fetish for lawns. Since my own particular advocacy is for sustainability, and most recently, meadow gardening specifically, I thus welcome the opportunity to be a part of this group. I hope you will allow me a bit of personal pontificating about the idea of lawn reform since the whole idea of meadows in residential gardens was recently questioned on the widely read Garden Rant blog.. If you must click away from our blog over to those good folks, I direct you to Amy Stewart’s response: I Can’t Believe We’re Even Having This Conversation. 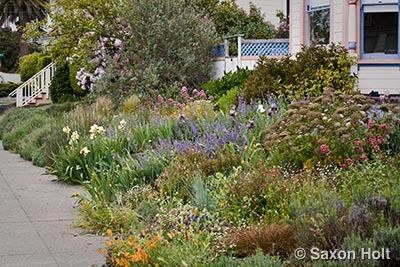 Amy Stewart’s front yard garden with no lawn. Amy gets it. 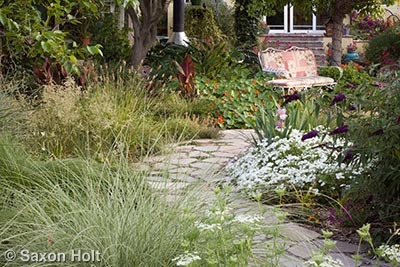 Lawn reform is not about anti lawn, it is not pro meadow, or pro any other use of lawn space, be it for a vegetable garden, a patio, or flowering groundcovers. Anything is up for grabs, lets go wild. I believe in garden reform, and lawn reform is an obvious place to start. You know who else got it ? Lorrie Otto, the amazing housewife turned environmentalist who led the charge to ban DDT so many years ago. I say “was” because Lorrie passed away in 2010. She must get some recognition for promoting ecological gardening and helping to start The Wild Ones. She was an inspiration to us all – even if you don’t know it. I suppose because I have spent years photographing meadows and have a book, “The American Meadow Garden”, I am to be some sort of expert on this. Sure, I have talked to a LOT of very thoughtful people about the definition of a meadow, both in nature and in a garden. I traveled the country looking for meadows, and …. there IS no one definition. In every region, local experts have different ideas. That is as it should be. But what do “experts” know ? I direct you to the marvelous commentary by legendary performance artist Laurie Anderson’s video: If you have 8 minutes to be entertained, and are suspect of experts, this may be the most fun part of your day. So who are the real experts on garden meadows ? Who would you look to for advice in your own garden, in your town ? Well, aren’t we all gardeners here, and aren’t we all full of our own experiences, successes and failures ? Don’t we all know the plants themselves determine the garden ? What we call it is irrelevant to our own satisfaction. Just do it. 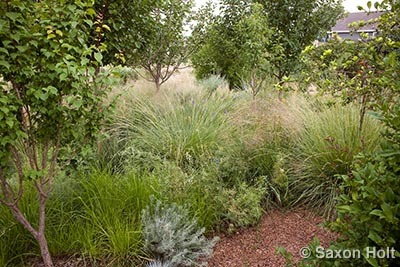 There are so many variations of a meadow across the globe that almost any loose combination of plants that cover the ground and has a few grasses can be called a meadows. Even those hyped up meadow-in-a-can schemes can be a meadow, albeit unsustainable and destined for weediness. While I genuinely wonder what the public thinks is a meadow, I don’t care. It is all good. 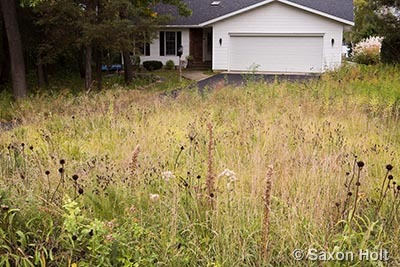 But when someone says: “even when they’re at their best, a meadow in a suburban development looks suspiciously like a weedy, unkempt yard at an abandoned property”, I do care. At their very worst a meadow looks like a weedy excuse for a broken lawn mower but at their best a meadow nourishes the earth, the critters around it, and the gardener who planted it. 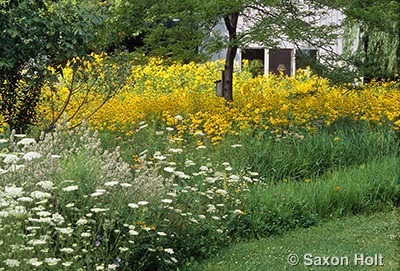 If a meadow can do this, do we care what the neighbors think ? 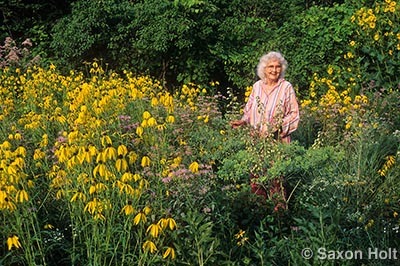 At their best a meadow can make a real difference in caring for the earth. 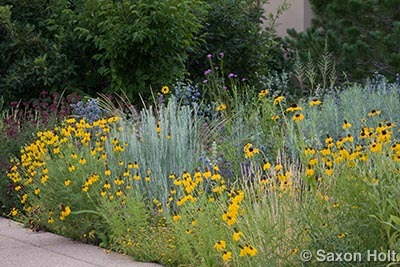 They represent an element of sustainability that too many folks pay lip service to without acting upon: habitat for insect pollinators, food for wildlife, low water, no imported hardscape, no need for machine grooming, even a garden of edibles – fruit, herbs, perennial vegetables. It is all good, and all can be found in a meadow garden. Lauren Springer Ogden’s backyard orchard and meadow garden. From touring the country looking for such gardens I know there are not many, but I know folks want to try. Let’s don’t get hung up on some book definition of a meadow and get back to lawn reform.